Summary: These first-half results were not too bad, not least because they included a record £5.1m revenue figure. However, the software developer did warn that rising costs would hurt earnings significantly during the second half of 2017 and throughout 2018. WOR recovered very well from its previous investment phase of 2009 and 2010, and I am left trusting the firm can repeat the trick once again. At least the accounts remain simple and flush with cash, and you could argue the underlying P/E is just 5. I continue to hold. I wasn’t really sure what to expect with these results. November’s annual statement had been somewhat mixed. Earnings had improved due to the weaker pound, but the company warned that greater investment spend would keep a lid on future profits. In the event, these first-half numbers showed revenue up 36% to £5.1m — WOR’s best ever six-month sales performance. A mix of increased income from existing clients, contributions from new projects, as well as the weaker pound, underpinned the top-line progress. In turn, operating profit surged 94% to £670k to give a reasonable operating margin of 13%. This H1 statement unfortunately suggested the upcoming H2 performance could be very underwhelming. WOR has ramped up its personnel and marketing spend during the last two years, and admitted a “significant further increase” to its cost base would be incurred during the rest of 2017. WOR therefore predicts earnings for 2017 to be “significantly reduced” from the level achieved for 2016. A “material adverse impact” is expected for 2018, too. 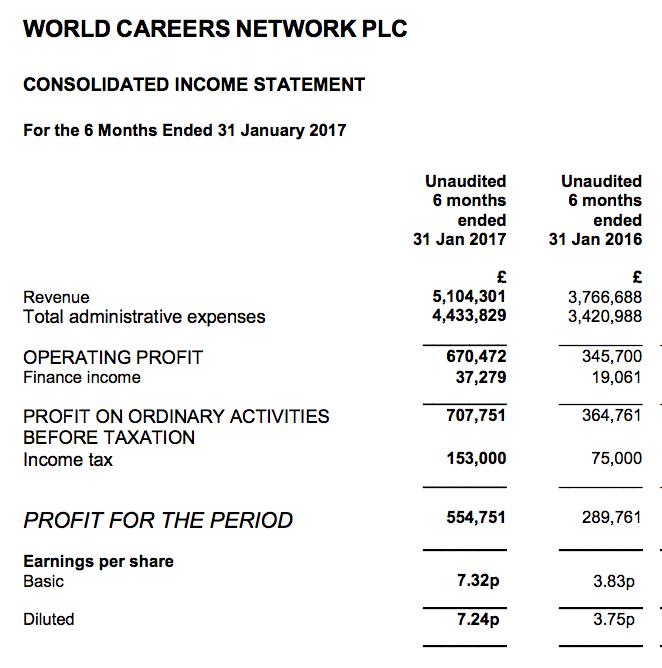 As a reminder, WOR’s operating profit for 2014 was £2.4m and this significant investment programme then saw the figure reduce to below £1.4m for 2015 and 2016. Given the group’s latest guidance, it seems as if 2019 will be the earliest chance for profit to return anywhere close to the £2.4m level of 2014. I have to confess, I had hoped a complete recovery could have been achieved by 2020, which now appears to be rather fanciful. I suppose even more guesswork is now required with WOR’s valuation. But for what it is worth, the group’s net cash position remains at around £10m and so the £16.6m market cap leaves only a £6.6m enterprise value (EV) for the underlying business. For the year to January 2017, WOR produced a £1.7m operating profit and, after 19% standard UK tax, could deliver earnings of £1.3m or 17.8p per share. The P/E on my EV and earnings calculations is therefore £6.6m/£1.3m = 5. True, the multiple looks very low, but that has always been the case with this obscure, illiquid small-cap. Indeed, with earnings set to tread water at best for the next few years, the chances of imminent share-price upside here must be zero. Nonetheless, WOR has recovered spectacularly from significant investment phases before and I continue to hold out hope that margins of 20%-plus will one day return and that profit will rebound beyond £2m. Until then, I will just have to trust that WOR’s 71% owner — the group’s chief exec — can ensure the ongoing investment programme eventually reaps suitable returns. I think the delay to publishing March and April’s data was caused by rules concerning the general election. Nonetheless, there is more encouraging news. February’s data revealed HMRC had paid WOR a sizeable sum (£246k) for an additional service (the implementation of recruitment ‘sift tools’). This new batch of data now shows HMRC paying WOR almost £30k for ‘quarterly sift tool test fees’. The term ‘quarterly’ is promising, as it suggests WOR may receive similar sums every three months. Also included was a £32k payment for some one-off work, and four payments of the standard £56k monthly system fee (February’s fee was paid in March). Anyway, for the current financial year (to 31 July 2017), HMRC has now paid £961,529 cash to WOR. On an accrued revenue basis, the total so far is £905,513. I still believe this current financial year should be just as lucrative as the prior year for WOR with regards to HMRC payments. Collecting only the monthly £56k fee for the remaining two months (June and July) would give total cash received of £1,073k for 2017 versus £1,050k received for 2016. The main point within this dataset is an annoying format change. It appears HMRC’s records are now being created with VAT excluded from the figures. So WOR’s usual £56,016 monthly payment is shown in June as £46,680. Perhaps I should have paid more attention to the descriptions within HMRC’s records. Anyway, for the current financial year (to 31 July 2017), HMRC has now paid £847,953 cash to WOR (ex-VAT). On an accrued revenue basis, the total so far is £801,274 (ex-VAT). I still believe this current financial year should be just as lucrative as the prior year for WOR with regards to HMRC payments. Collecting only the monthly £47k (ex-VAT) fee for the remaining month (July) would give total cash received of £895k (ex-VAT) for 2017 versus £875k (ex-VAT) received for 2016. There was a data format change last month and it appears HMRC’s records continue to be created with VAT excluded from the figures. For July, WOR received its usual £46,680 monthly system support payment (£56,016 inc VAT) and a further £24,850 (£29,820 inc VAT) quarterly payment for something called ‘sift tools test fees’. Anyway, for the current financial year (to 31 July 2017), HMRC has now paid £919,484 cash to WOR (ex-VAT). That figure compares with £874,946 for the year to 31 July 2016. On an accrued revenue basis, the total for the current financial year (to 31 July 2017) is £872,804 (ex-VAT). That figures compares with £828,266 for the year to 31 July 2016. While these figures may not tell the whole story of HMRC payments to WOR, they do suggest WOR received about 5% more from the government department during 2017 than 2016. I shall await the 2017 annual results and report for the finer details. Oh dear — no reference to WOR this month. This has happened before — my records show June 2015 was the last time HMRC did not pay WOR during the month. I can only trust HMRC’s next update will show payments to WOR for August and September. This dataset shows WOR receiving for August 2017 its usual £46,680 monthly system support payment (£56,016 inc VAT). On an accrued basis, total HMRC revenue for the current financial year (to 31 July 2018) received is £46,680 (ex-VAT).